Mobility is essential to our ability to participate freely and independently in society, but so so often we fall WAY short in creating spaces that are fully inclusive. Which means the pressure is on innovators to create smarter assistive technologies. The Mobility Unlimited Challenge is offering $4 million to support this effort. The shortlist (top 5 finalists from 80 entries) are pretty cool. Check them out! Pheonix Ai is a lightweight, self-balancing, ‘smart’ wheelchair with power-assist technology to help make slopes easier for the user to navigate and ascend. The design also uses smart sensors to automatically self-configure with how the user is moving. Quix is a highly mobile, powered exoskeleton that is designed to offer fast, stable, and agile upright mobility. Essentially, it’s a legged robotic system that aims to use a combination of control algorithms and perception technology to allow the user to enjoy a level of mobile independence that existing exoskeletons cannot provide. Evowalk is a personalized, time muscle simulation technology that wraps around the user’s leg. The sleeve’s sensors track walking motion and stimulate the correct muscles at the right time to improve mobility. Qolo is a mobile exoskeleton-on-wheels designed to assist sitting and standing while removing the chair element of the conventional wheelchair. The device is controlled by the upper body and allows for hands-free operation so that users can travel around in a standing position. Moby proposes a wheelchair scheme that is accessed through a simple app, much like popular bike-sharing systems seen in urban areas. It would offer a series of wheel-on electric devices to make commuting easier for people using lightweight manual wheelchairs. The finalists will receive $500,000 to develop their device and present in Tokyo. I’m excited to see if/how these concepts will translate into real life application. 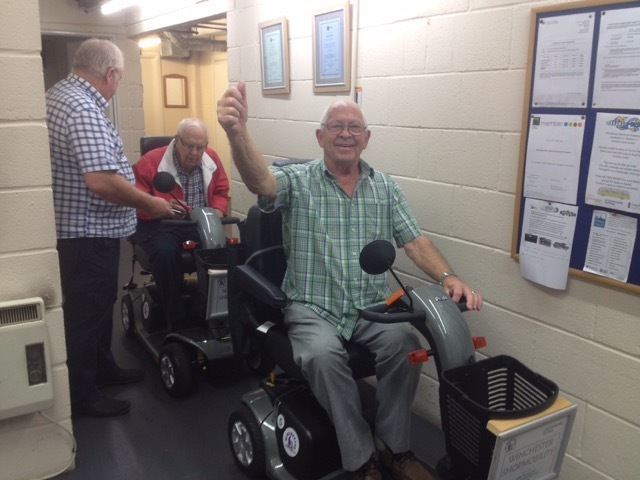 These happy guys (my brother in laws father and his brother) were able to do some sightseeing together in their hometown Winchester, England thanks to the service known as ShopMobility. The Disabled Drivers Association of Ireland established this service 12 years ago to make it easier for people with limited mobility to access shopping centres and other facilities. It’s offered at a small charge, currently £4 per day in England, though the price varies depending on the location. How do they do it? ShopMobility lends manual and powered wheelchairs, as well as powered scooters, to members of the public who have limited mobility. This service gives people of any age the opportunity to visit leisure and commercial facilities in a town, city, or shopping centre. What’s particularly great about this service is the fact that you don’t have to be registered as “disabled” to use it. Anyone with limited mobility, whether it’s due to a temporary or permanent impairment, can use the service. They just want to give people the freedom to move around. Services like ShopMobility help promote a culture of inclusivity, equality, and accessibility. Check em out next time you’re in England and lets hope to see this idea spreading across other communities soon!